As social media has infiltrated our everyday lives over the past ten years, Instagram has become many things to its users. It’s often described as a place where comparison runs rampant and insecurity flourishes. But Instagram has also evolved, thanks to highly efficient algorithms, to be a locus of discovery. In opening the app, users are served up suggested profiles of those the AI deems a match for the user’s interests. 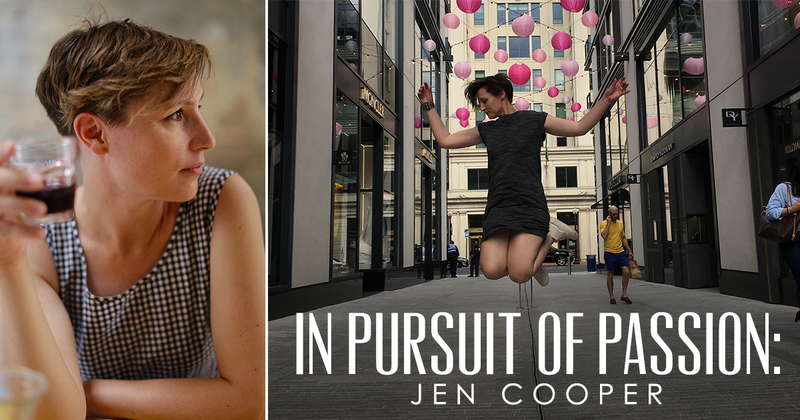 It was through that exact semi-serendipitous crossing of paths that I stumbled across the profile of Jennifer Cooper several years ago. At first glance, Jennifer appears to be a summary of chic sophistication and effortless artistic expression. Thanks to a delightfully healthy serving of self-deprecation, however, someone who may seem thoroughly intimidating instead feels like the friend who tells stories so witty and jam-packed with humanity, you giggle helplessly until your cheeks ache. Jennifer is a well-practiced storyteller with the relentless curiosity, the courage to ask unexpected questions, and the willingness to follow back roads and dead ends to find the heart of a story. 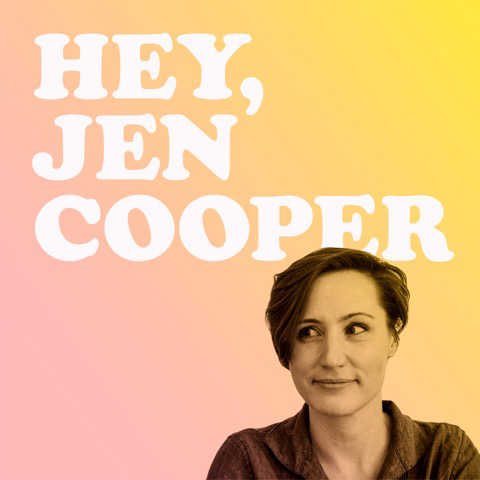 All of which make her podcast, Hey, Jen Cooper, launched in 2017, a delight to follow. An endeavor several years in the making, the podcast is, as Jen puts it, “an exercise in discovering what holds us together in a world of disconnected bits,” a driving force behind Jen’s passion for storytelling. Q: Hey, Jen Cooper. Tell us about yourself - how would you describe yourself if we met you on an elevator? A: Oh lordy, the elevator pitch. Okay… Um… Let me get into my wonder woman pose. How’s this? I’m a woman on a mission to get to the heart of what matters and then tell a great story about it. I also like the tagline to my podcast, so maybe I’d use a modified version of that: In a seemingly disconnected world, I’m on a search for what holds us together. Q: Your résumé/current plate is a kaleidoscope of passionate pursuits, which is what this series is all about. How have you navigated the winding path of your career and varied passions? It used to upset me that my focus never seemed to be wherever anyone else’s was. People would say, “You have a very (pause) interesting way of seeing the world.” Or, “She’s very… creative.” Now I love that! It’s been my secret superpower. I’ve also been incredibly fortunate that I’ve been able to center whatever it is that I’m doing at the time on the period of life I’m in. So, when I was in my 20s, I focused on doing what I studied to do — work with children. In my 30s, I created a parenting series for PBS Parents about raising school-aged kids. 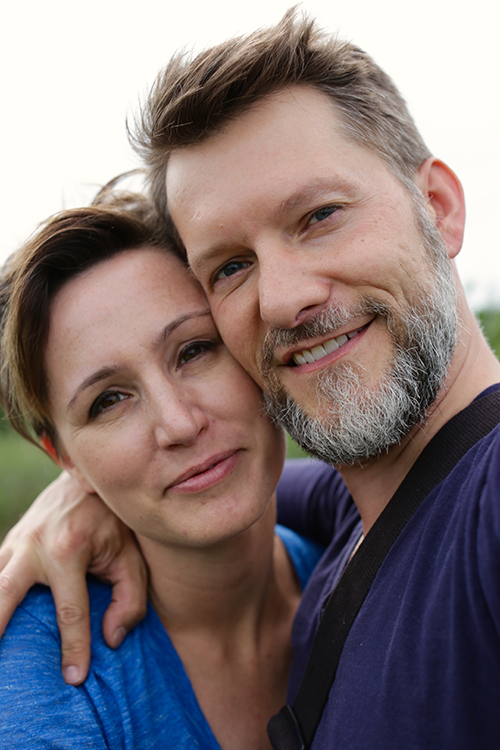 Now, in my early 40s, I’ve waded into my mid-life crisis by turning to a search for connection and meaning in this crazy world. I guess I’m an honoring-the-season-of-my-life type, even when those seasons sucked. Which, of course, we’ve all had a season like that before. But I’m not afraid to learn new things; I actually really love it! Which is probably why I’m open to so many changes in my career/passions. Oh, and I have to credit great people. I’ve only been able to navigate this winding path because of others who have either shown me the way or held my hand when things got rocky. Q: You describe yourself as a lover and a fighter - will you tell us about why those jump to mind as self-descriptors? A: Ha! Because I’m passionate. I love deeply and I’ll fight for the people and ideals I love. A friend once made the observation that I use my anger for good. And I can’t deny that anger has sometimes been the best anti-compass I have. If something inspires anger, it means I should change my course. Q: I first came across your work when you were blogging on Classic Play. How did you find yourself in the world of blogging? A: Blogging opened up my whole world. I was never able to produce a livable income from blogging, which I think was every blogger’s dream back in the day, but through it I made incredible connections, learned a ton of new skills, and it was part of the journey I needed to get where I am today. It also taught me what I didn’t want to do and who I didn’t want to be either. And there’s great value in that as well. Q: Your collaborator on South of Brooklyn is none other than your husband, filmmaker and photographer, Dave Cooper. Where did that project come from, and what’s it like to work with your significant other? A: Dave has been my collaborator since I was 16 and he was 17. We’ve produced a whole life together, not to mention two fantastic kids. So, of course the next logical step was to create a site together. South of Brooklyn was born out of a couple different things. We wanted to share stories of artists and artisans — the ones that weren’t given the same type of platform as the ones out of a larger market like NYC. There are so many incredible stories of dreamers out there and the site is a celebration of that. Dave and I, as similar as we are after 25 years together, (we often unintentionally dress alike) have very different styles. What was hard about working together in the beginning is now the source of our magic. He makes sense of things looking forward. I understand things best in retrospect. He’s thoughtful and precise. While I’m thoughtful, I’m far more general. I’ve definitely learned from him though the power that comes from precision and editing. And I’d like to think he’s learned the power that comes from embracing a little bit of mess and uncensoring. Q: Let’s talk about another one of your projects, 101 Jumps. What does/did that mean to you? A: Everyone carries around a certain amount of baggage that weighs them down. The 101 Jumps project was my way of untethering myself from my own nonsense and breaking free from it. It’s symbolic, but there’s also a physicality to it. For someone who spends a fair amount of time in her own head, I needed that physical component. It’s been an exercise in getting out of my head and also outside of my comfort zone. I have to be able to put myself “out there,” or maybe it’s “up there.” Either way, it’s just plain fun! I loved the feeling of leaping when I was a kid in ballet and I love that I can still tap into that. Q: Your newest endeavor is a podcast called “Hey, Jen Cooper.” What made you want to walk down the yellow brick road of podcasting? A: It’s funny you mention the yellow brick road, because the decision actually occurred on an old trolley trail! Last summer, I’d left a job to pursue a move that didn’t happen and wasn’t sure what to do next. To avoid the anxious feeling I get when I’m between things, I took long walks and listened to podcasts. There’s such an intimacy to the medium that I didn’t even realize I was craving. It’s one thing to write your heart out, but it’s another to hear words from the heart, straight from the mouth. A few years back, I’d toyed with the idea of writing a book featuring stories of inspirational women. I’d recorded a few interviews, but when it came time to write the stories, I kept hitting a wall. It was more than writer’s block. It was that I never wanted to take ownership of the stories themselves. And that’s something you have to do as a writer — you have to own the story as if it’s your own. And that can leave a disconnect between the story you want to tell and the story the individual wants to tell. I started thinking of all the interesting people I’ve met along the way and thought, Yeah, I can make something out of this. And here we are. Q: In a podcast episode featuring artist Leslie Fandrich, you mention that, as a child, you took Anne of Green Gables to heart, specifically her willingness to stand up for herself, to be loud, to be awkward. What about Anne Shirley felt familiar and powerful to you? A: Okay, first of all, I used Red Zinger tea to try to dye my hair red when I was a kid. That was my level of commitment to Anne Shirley. Anne was like me. She was rebellious, strong willed, idealistic and let’s be real here: she had stunted social skills. She wasn’t suave, she was kind of a mess. But she was always reaching out, trying to connect, trying to understand people. I guess I’d say we share that same sort of curiosity and love. Q: Storytelling is a consistent thread in your life. What is it about interviewing people that’s so compelling to you? A: People are the most fascinating thing around! We’re all so weird and wonderful, and I don’t know… I love that you can sit down with someone and in the process of opening up realize that while certain elements of your stories are different, the journey is the same. We’re all just trying to figure things out while we’re here. Q: When you were a child, what did you think you’d be when you grew up? Q: Our mutual friend Sheri Silver aptly described you as a “shape shifter,” which I love. How have you/do you navigate the many different phases of life, career, motherhood, marriage, passion, ambition, and struggle? A: Honestly, I don’t know. I think it’s that deep down, I’m a hopeful person that loves life and throws herself at it. So I guess maybe it’s enthusiasm that’s gotten me through it all. Q: You designed a t-shirt that’s unabashedly political and you’re donating the proceeds to Southern Poverty Law Center. Tell us a little about that - and how the events behind the shirt have influenced your thinking over the past year. A: I have two guiding life principles: 1. We are better together than we are apart. 2. The more diverse the ecosystem, the healthier the environment. These two facts are what drove the t-shirt. The illustration was inspired by all various signs I saw while I was at the Women’s March in DC this past January. A friend of mine and I actually partnered to create the first run, which was used to raise funds for the ACLU. After the events in Charlottesville, I knew I wanted to bring the shirt back because there’s a third thing I know: This is my home, too, and in my home, there’s no room for hate. Q: Would you describe yourself as a bold/brave/daring woman? How would you define that kind of woman? A: No. I see myself as a fearful, anxious woman who is routinely unsure of herself. But most people see me saying what I feel needs to be said, getting back up after getting knocked down, and always willing to learn and grow. So, I guess a lot like a bold/brave/daring woman. Q: I have to tell you - from the outside looking in, it would appear that your family is one of the coolest around. It seems that you’ve mastered the trick of encouraging individual interests, passions, and pursuits while also parenting responsibly. What are your most important values as a family? A: Thank you! I’m pretty excited about our family. Honestly, I only really have one secret and that is I operate on the “respect is a two way street” mentality when it comes to parenting. I respect where they’re at developmentally, emotionally and individually. Thankfully, that approach has seemed to work out great so far. Q: You’ve admitted that you feel a powerful yearning to make the move from Baltimore to California. It sounds like you’re planted for now, but will you tell us what was behind the wanderlust and what’s so alluring about the west coast in this phase of your life? A: The art, weather, connection to nature, and just overall energy are all big draws. It’s weird because when people meet Dave and me, they tell us we seem like we’re California people. But we’d never even been until a few years ago when we did a tour of California in an RV. It was magical and we’ve been plotting and planning our move ever since. Plus, with my husband being a photographer and filmmaker, we love the idea of the California light. The kids are looking forward to move, so that’s been a real driving force too. Q: Wrapping up, I feel like out of all of the Coppola wines, the one I’d buy for you as a dinner party guest would be a bottle from the Storytellers series, given your work. Would that be a good choice, or would a bottle of the sparkling Sofia Rosé be just the thing? A: The greatest meal I ever had was in an alleyway under a frescoed arch in Sienna, Italy, so any wine that celebrates the beauty of Italy and could get me back in that frame of mind is one I’d happily share with friends. I’m thinking Pitagora from the Storytellers series would do nicely. Plus, come on! A wine dedicated to those curious about the nature of how things work, and their thirst for knowledge? It’s perfection.